Our goal was to calculate annual indices and population trends for all stations that had at least 10 years of hourly data through-2016) entered into HawkCount.org. Sites with less than 10 years were considered to have insufficient data to estimate a meaningful trend. Species with fewer than 10 individuals per year at a site were also considered to have insufficient data for trend analysis, and were thus excluded. It is important for users to recognize that the RPI partners do not have the resources or staff to do exhaustive checking of raw data and subsequent results. We rely on the sites contributing data to alert us to problems and to provide accurate data in HawkCount. Any questions on datasets or results can be sent to brown@hmana.org. Site descriptions and protocols are posted within the site profiles on hawkcount.org. Results are presented in two formats: trend graphs containing the long-term linear trend for each species and site (see trend graphs), and trend maps which graphically show the most recent 10-year trends across sites for a given species, in this case for the period 2005 to 2016 (see trend maps). The following example shows the long-term trend for Northern Harrier at Hawk Mountain Sanctuary in fall. The black dots on the chart are estimated indices of annual population size as calculated by the statistical model, with error bars representing the 95% credible intervals for the annual indices. Annual indices are expressed on a linear scale and represent the average of the predicted number of individual birds detected per day of survey. If present, the blue line is a smoothed (loess) visualization of the change in annual indices over time. The subtitle of the plot contains the estimated linear trend value for the long-term trend and for a trend based on the most recent 10-years (time periods in parentheses). These trends are expressed as annual percent change in population index size, and assume a linear change in population size among years over the time period examined. The lower and upper limits of the 95% credible interval (CI) of the trends are shown in parentheses. In the example shown, the CI do not include zero, suggesting strong support for the observed decline in migration counts for this species over both the long-term and over the past 10 years. An * following the reported trend and CI provides the posterior probability of the trend: a value greater than or equal to 0.95 provides additional and strong support for the observed trend. 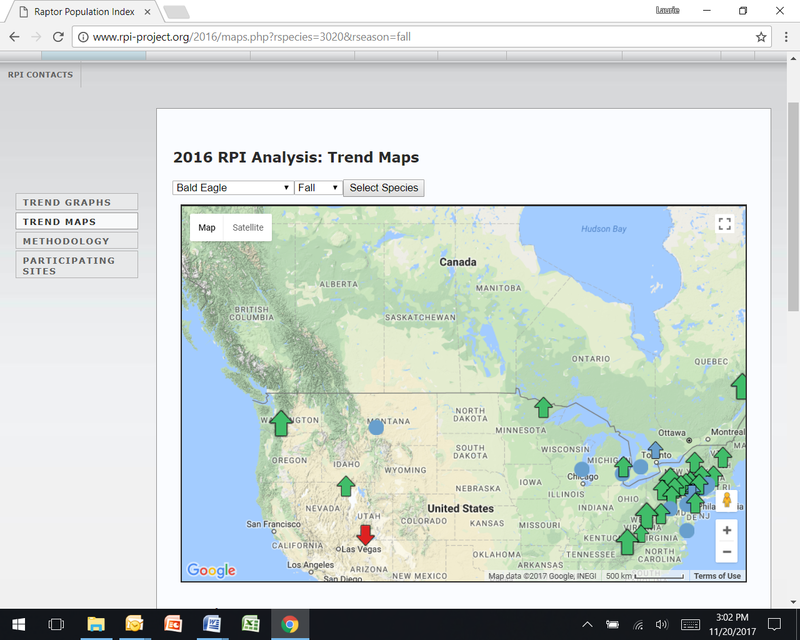 Trend maps display the trends calculated from all RPI stations to more easily visualize the spatial variation in trends of a species over a large geographic area. Consistent trends across sites within a region give us confidence that the results we see are representative of trends in the underlying regional population, and not the result of site-specific biases. To ensure that all trends are directly comparable, maps show only the trend based on the most recent 10 years for each station. The example below represents the population trends of Bald Eagle based on fall count data. Upward arrows suggest a positive trend was observed at a site, and downward arrows suggest a negative trend was observed at a site. Green and red arrows suggest the 10-year trend is strongly supported (95% credible intervals exclude zero), while blue arrows represent trends with 95% credible intervals that include zero, but where the posterior probability that the trend was increasing or declining was nevertheless >= 0.95, which suggests there is mixed support for the trend. Blue dots represent trends with little or no support, i.e., 95% credible intervals included zero, and the posterior probability was < 0.95. Note that the size of the green and red arrows is proportional to the magnitude of the increase or decline, as explained in the map legend (not shown). You can click on any of the markers to see more details about the station name, the trend, and the time period covered. You can also zoom in or out to better see the details in areas where there are several nearby stations, such as along the Appalachian Mountains. The example clearly shows that Bald Eagles are doing very well in the east but appear to have stabilized in the west where counts are generally much lower. Prior to analysis, we filtered data to exclude days of the year and hours of the day that were not typically sampled at a station by including only those days of the year and hours of the day that included the inner 95% of observations at a station. We also excluded species that were not detected during at least 50% of all years surveyed at a station. Hourly data were aggregated to daily totals, following the recommendations in Crewe et al. 2016 (accepted for publication). We used hierarchical linear regression in a Bayesian framework (INLA, R-project) to estimate the linear change (%/year) in the number of individuals migrating past each count site each day over the past 10-, 20- and 30-year time periods. A trend for the full time period at each site was also estimated. The regressions for each time period assumed either a negative binomial or Poisson distribution of counts, and estimated first- and second-order effects for day of year in addition to the continuous year (trend) effect. We also assumed a random effect for year which accounted for temporal auto-correlation of counts among years, and a random effect for day of year, for which we assumed independent and identically distributed errors. Annual indices of population size (mean number of hawks per hour Â± standard deviation) were estimated from the posterior distribution of each trend model. where is a first-order autoregressive (AR1) random effect for year, and is a hierarchical term to account for random variation among days of the year. While an AR1 random effect for day of year nested within year might be more appropriate to properly partition variation in daily counts among fixed and random effects, we found using simulated migration counts that specifying the random day effect as independent and identically distributed (IID) had no noticeable effect on trend bias, or probability of estimating a precise trend (probability that the simulated trend fell within the credible intervals of the estimated trend; T. L. Crewe, unpublished data). Specifying the random day effect as IID did, however, significantly increase the speed at which sites could be analyzed, and given the volume of data to analyze, an IID random effect was specified. Number of observation hours in day j was included as an offset to account for variable daily effort. We first fit the model by assuming a negative binomial data distribution. If the estimate for the random year effect was large and spurious (>100), we instead re-fit the same model but assumed a Poisson distribution of counts. For both data distributions, year estimates and 95% credible intervals were back-transformed to annual rates of population change using 100*exp(estimate)-1. Trends were calculated using the full dataset, as well as for all 10-year subsets to estimate 10-, 20-, 30-year (etc.) trends where appropriate, such that if the final year in the dataset was 2014, a 10-year trend would include 2004-2014. We estimated annual indices of population size for each species on the response scale (mean hawks per day), by calculating the mean and standard deviation of predicted daily count from 1000 samples from the posterior distribution of the above trend model. The trend was calculated as the % rate of change per year = 100*(exp(year coefficient)-1). This converts the year coefficient, which is an estimate of the instantaneous rate of change per year, into an estimate of the discrete rate of change per year between any year and the following year. Crewe, T. L., P. D. Taylor, and D. Lepage. 2016. Temporal aggregation of migration counts can improve accuracy and precision of trends. Avian Conservation and Ecology (accepted for publication). R Core Team. 2014. R: A language and environment for statistical computing. R Foundation for Statistical Computing, Vienna, Austria. [online] URL: http://www.r-project.org. Ross, B. E., M. B. Hooten, and D. N. Koons. 2012. An accessible method for implementing hierarchical models with spatio-temporal abundance data. PLoS ONE 7:e49395. Rue, H., S. Martino, F. Lindgren, D. Simpson, and A. Riebler. 2014. INLA: Functions which allow to perform full Bayesian analysis of latent Gaussian models using Integrated Nested Laplace Approximation. [online] URL: http://www.r-inla.org. Annual indices and trends can also be downloaded from NatureCounts in an Excel compatible format, if you wish to create your own graphs for presentation as well. Simply look for the Download button of the population trend tool on NatureCounts.